Showtime at the Cobbler's Cove jetty in St. Peter. 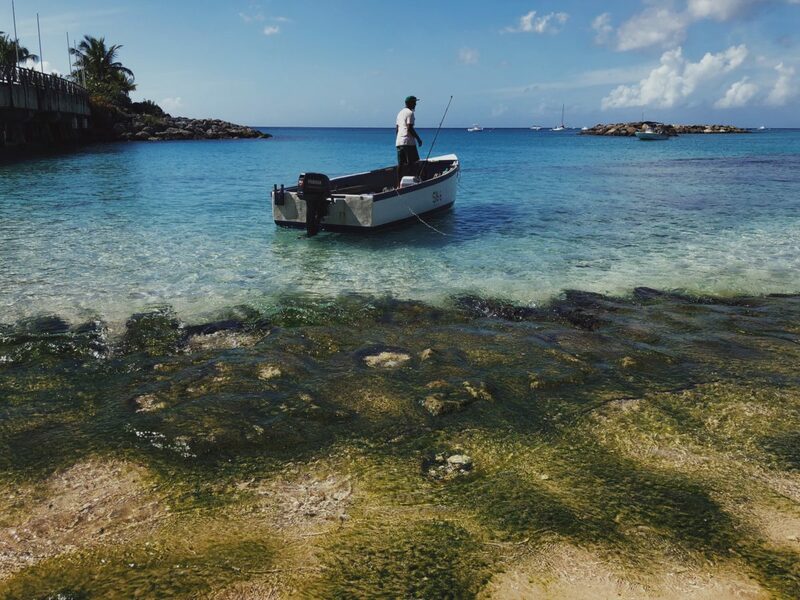 The Caribbean is sold as a promise—of unparalleled beauty, of escape from responsibility, of impenetrable paradise. Largely untouched by hurricanes Irma and Maria, which displaced millions and killed thousands of people on sister islands, Barbados remains a carefully kept tourist’s dream. Wedged between the placid Caribbean Sea on the west coast and the tempestuous Atlantic Ocean on the east, the pace of life here is slow, but the seduction is fast-acting. Barely 10 minutes into my trip, I lie back in my hotel chaise and snap a photo of pale blue waves lapping up against uninterrupted stretches of smooth sand. Not even a footprint would dare spoil the curated perfection that lies in front of me. Economic stability in this part of the world depends on tourism and the successful sale of this image. 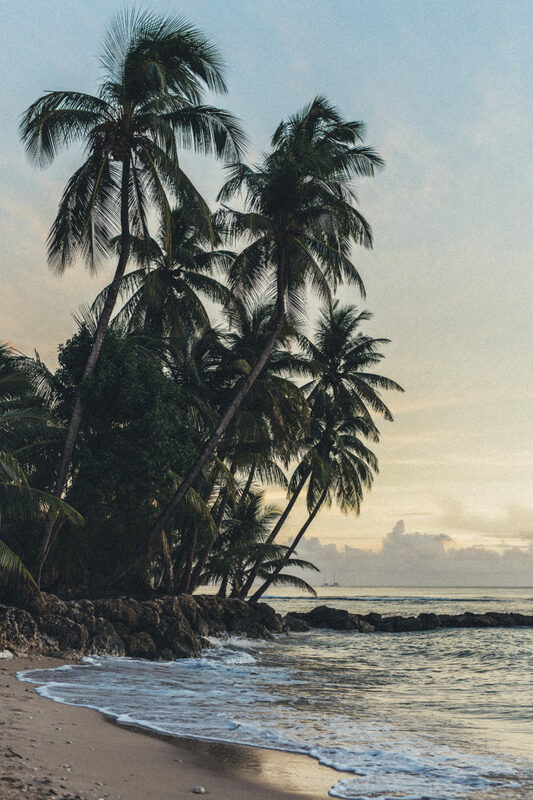 A former British colony and center of the slave trade, Barbados is portrayed to outsiders less like a living, breathing island than a singular lounge chair to be sat upon. 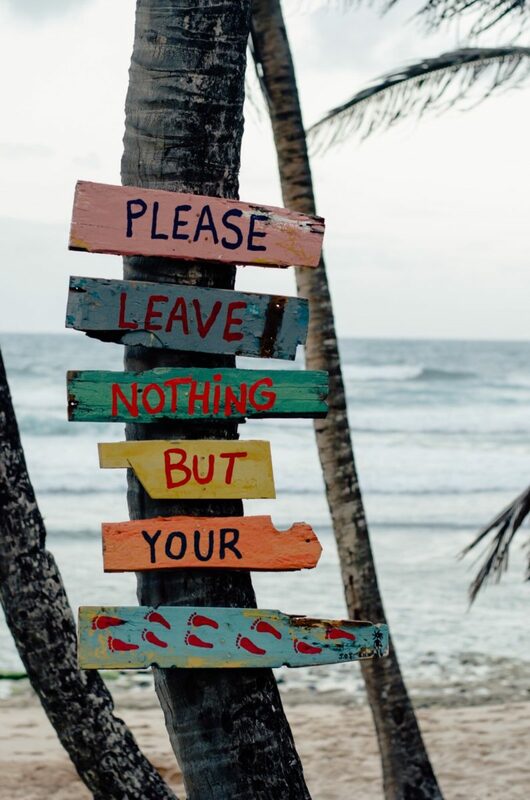 Out from beneath the shade of the beach umbrellas, however, there are artists, thinkers, farmers, chefs, and service workers who have a different view of their island home, a place they know to be diverse, vibrant, conflicted, and very much alive. 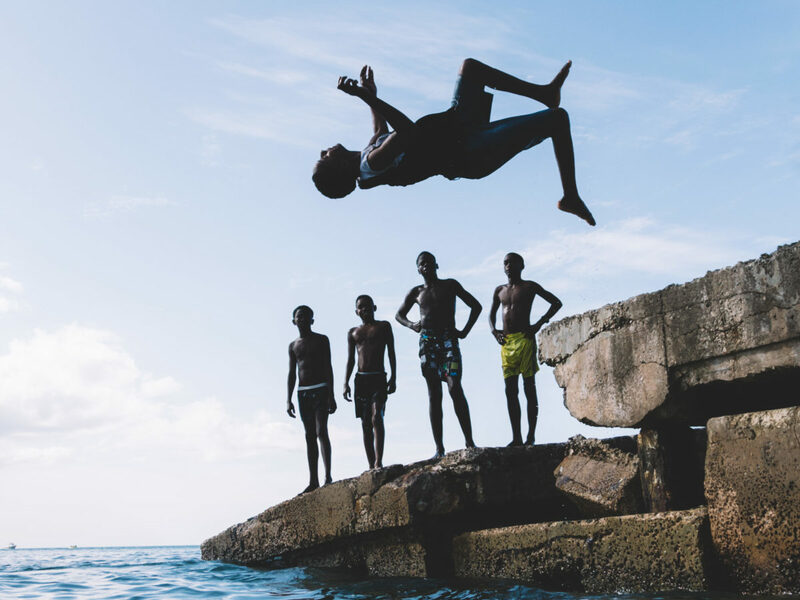 While tourists may flock for the sole purpose of napping in the sun, the local person’s Caribbean is a conscious one—alert, aware, and thoughtful. On my trip, I receive a different kind of island tour by way of my driver, Emerson. In between stories about his stepchildren and his four Chihuahuas, he apologizes profusely for the mounds of Sargasso seaweed that blanket the beaches of the jagged, windswept east coast—seaweed that has drifted south due to changing ocean climates. In his voice I sense worry about the eroding façade of his not-so-perfect island. I tell him I think it’s beautiful no matter what, and I mean it. 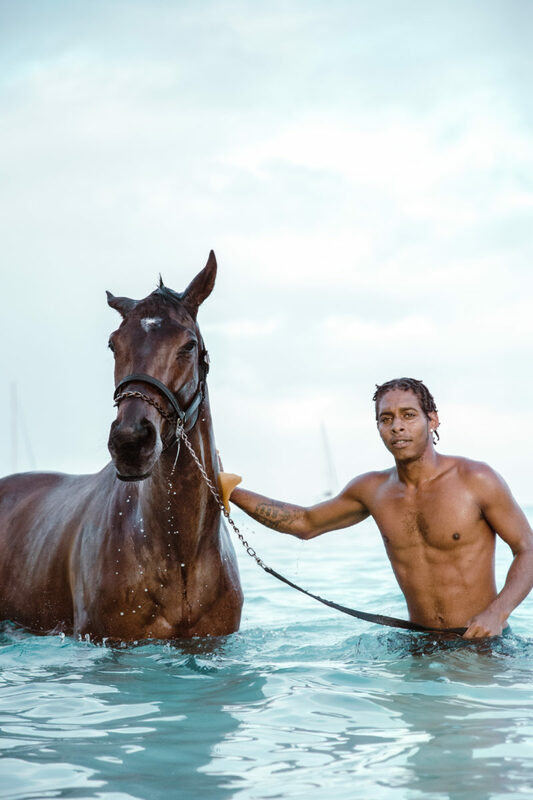 A stable attendant and race horse bathe at Pebbles Beach in St. Michael. Horses from the nearby Garrison Savannah are brought here to swim for rehabilitative purposes. 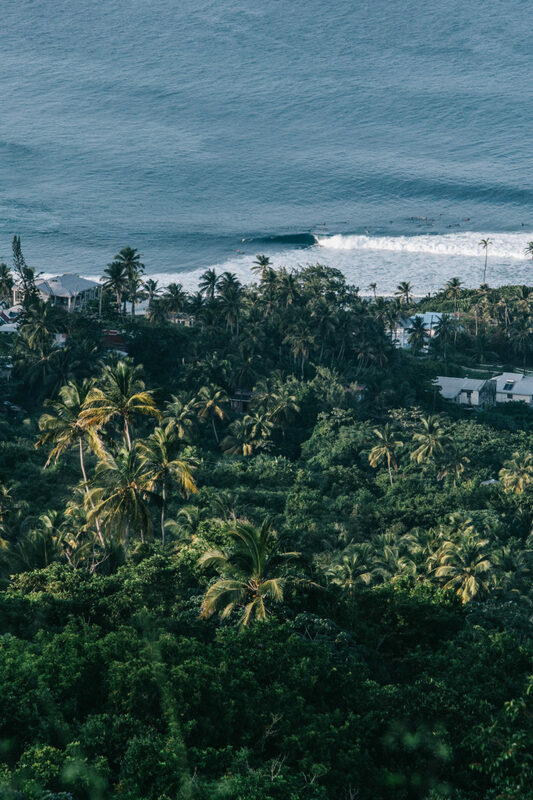 From high on Hackleton's Cliff, the view of Soup Bowl, a popular east coast surf spot, is sublime. Fisherman anchoring for lunch at Port St. Charles in St. Peter. Oistins in Christ Church and the Bridgetown Fisheries Complex are the island's two main arteries for the wholesale and retail of local fish. Two men in the middle of a road tennis match in St. Peter. 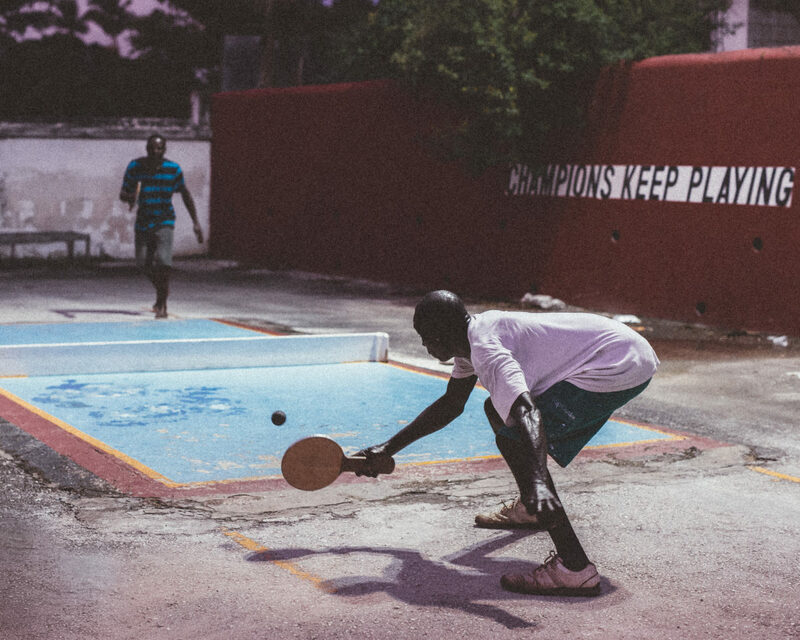 Road tennis is a popular game on the island that originated in the 1930s. 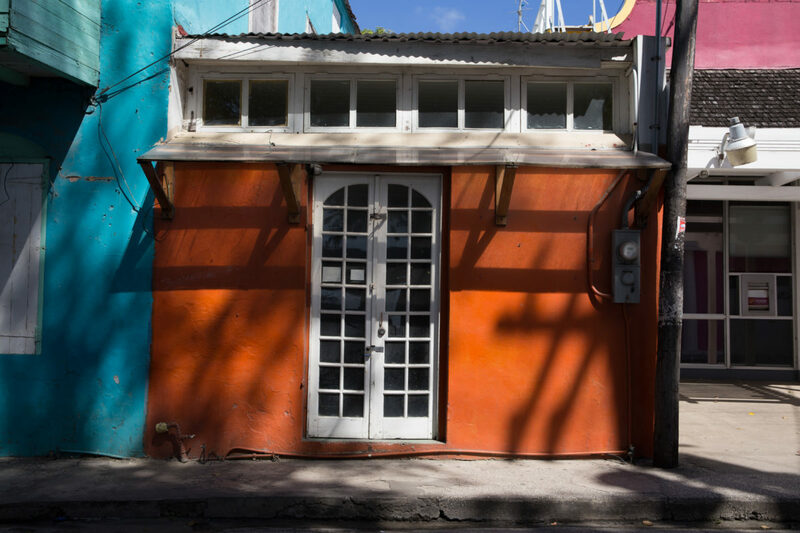 The storefronts that line the streets of Speightstown, a popular neighborhood on the west coast, are painted showstopping hues. 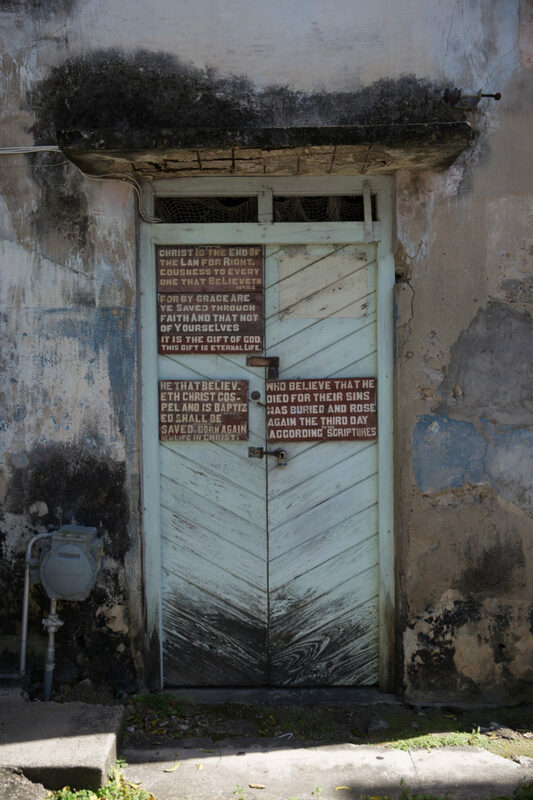 Religious signage on a colonial house in Speightstown, St. Peter. Christianity is the dominant religion on Barbados, though there are sites of worship from every other major denomination on the island, too. A cluster of palm trees at Kings Beach, St. Peter. 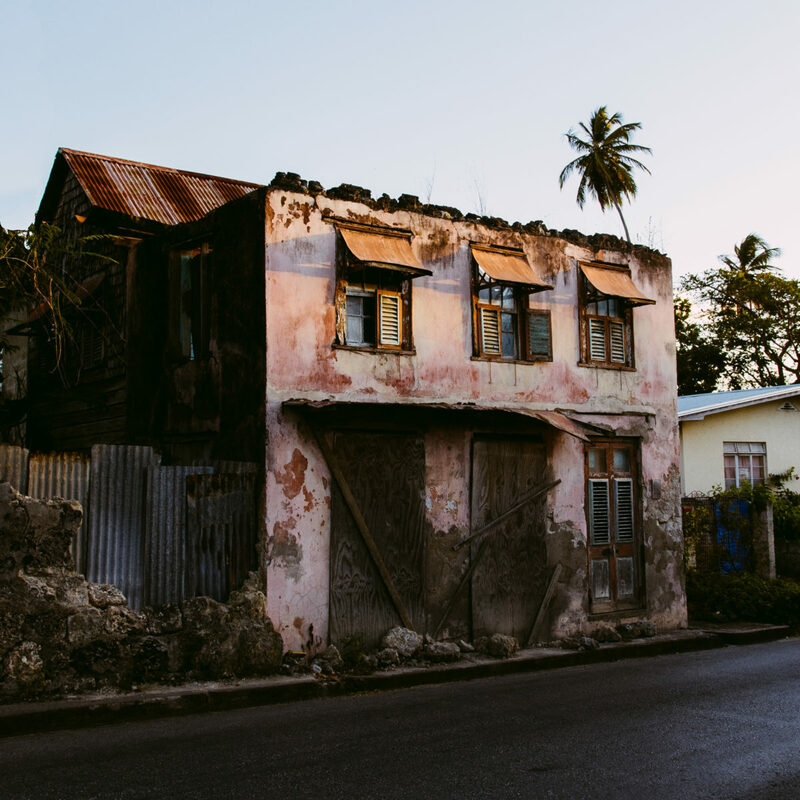 A colonial house in need of some repair, in Speightstown, St. Peter. 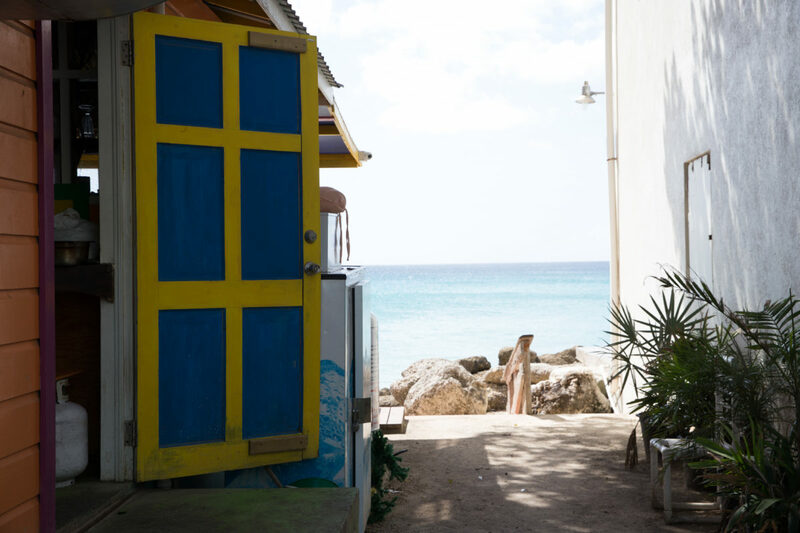 Young creatives, such as artist Sheena Rose, love to spend afternoons on the shores of Speightstown, enjoying their island "like a tourist would." 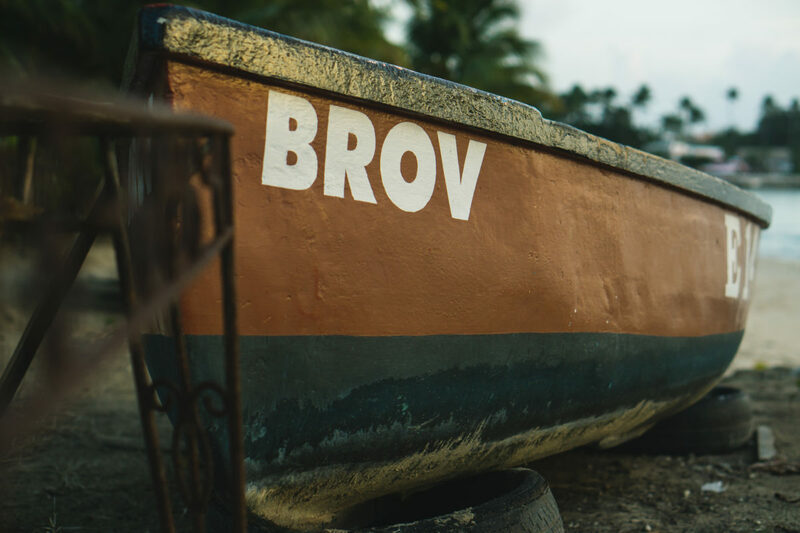 Smaller vessels with an outboard motor, like this one shot in St. Peter, are colloquially referred to as a "moses" in Barbados. Signage encourages visitors to pick up after themselves in Bathsheba, St. Joseph. 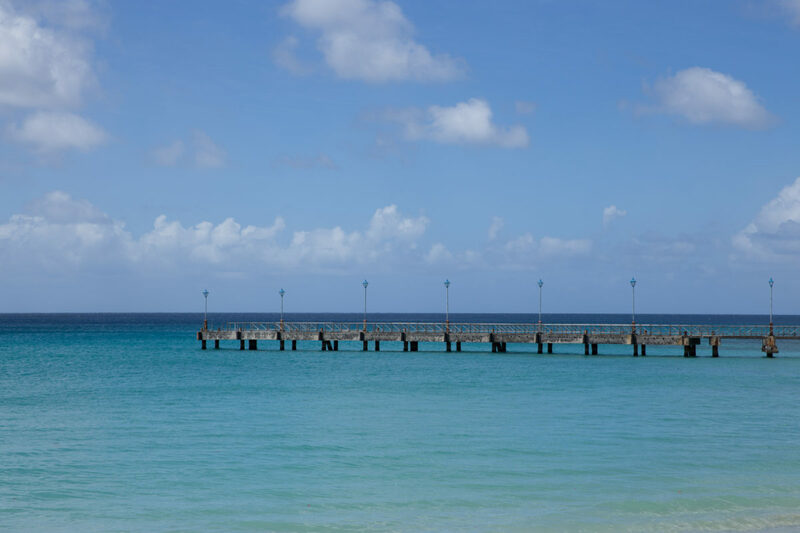 The Speightstown jetty is frequently damaged by tropical storms, and just as frequently patched up with the help of residents and community members. Local chef Jason Howard hosted a pop-up dinner at his soon-to-be Speightstown restaurant, The Top Deck, where he raised money for jetty repairs. Barbados has many "windows to the sea," as such views are called.